Click on the link above for trip details! We made it to Lloydminster today around lunch time. I had forgotten how Lloydminster is; it appears to me to be the "wild west" of the 21st century. Coming along the Trans Canada from Saskatchewan, you first see the Husky heavy oil upgrader just before crossing the border into Alberta. 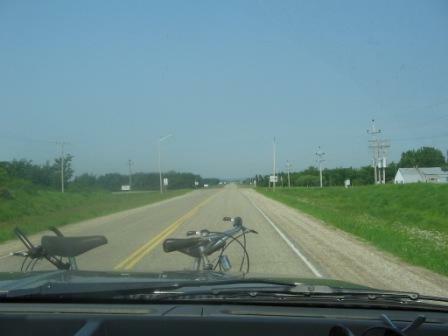 Then we get into town, I got cut off twice before getting to the west side of town (after the 401 in Toronto, I felt right at home!). The pick up trucks have replaced horses of the 19th century and the town has a "gritty" western feel about it. There is lots of activity on the roads, tankers bringing oil from the local oilfields to the upgrader, all kinds of oilfield service vehicles moving around. There are numerous support services in the area as well. 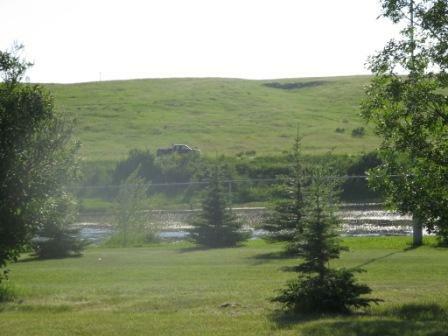 We tried to get into a golf course/RV park just west of town (it was full with mostly permanent oilfield workers), we moved about 20 Km. 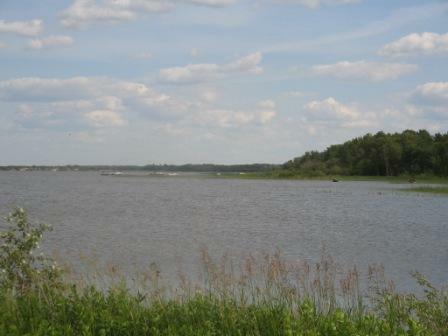 north of town to a regional park on the Saskatchewan side of the border called Sandy Beach Regional Park. It's quieter and more scenic. 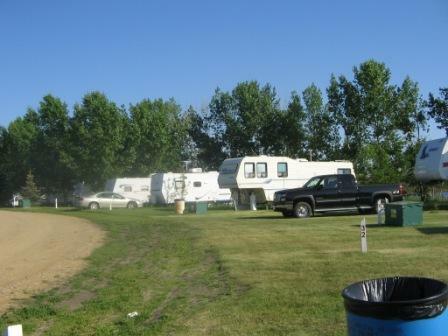 I provisioned and fuelled up in LLoydminster after setting up camp and then returned to the site, it's hot, about 30C. The pick up truck is on the highway that separates Saskatchewan from Alberta, the hill in the background is in Alberta, we are in Saskatchewan. We decided that after 300 Km. 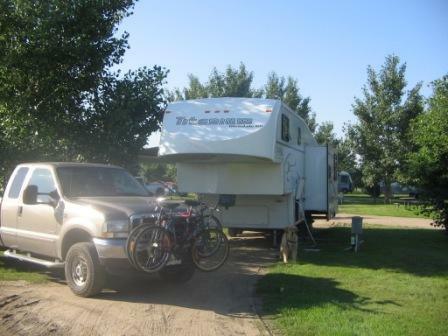 or so of driving, and the bugs last night, we needed to treat ourselves, so we booked into this full service RV park just west of Saskatoon. Saskatoon has some of the strangest roads out here, we went into town for money and provisions and were floored by the traffic and congestion, an urban planner's nightmare! 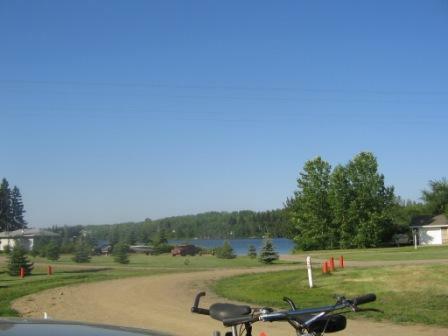 We will get some pictures of the park for the site, then it's off to Alberta tomorrow. We spent one night at this park, which is just north west of Yorktown. The mosquitos were the worst that we have encountered on the trip so far, and since Suzette and I have already donated a pint of blood each to the critters at Grundy and Obatanga provincial parks in Ontario, we decided to spend the evening inside. The good news is that we have gained another hour of time when we hit the Saskatchewan border, even so, we still got up with the sun on Monday morning, so we left the site before 9:00 am. This is Good Spirit Lake, it looks like there are a lot of fish in there. 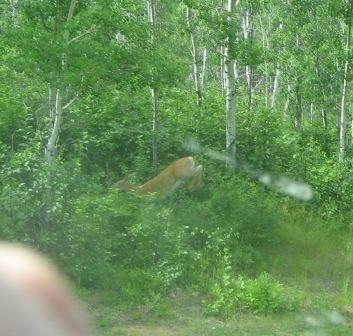 On the way to the lake, we caught a deer crossing the road, I was not quick enough to get a shot of the deer looking at us, but you get the general impression! 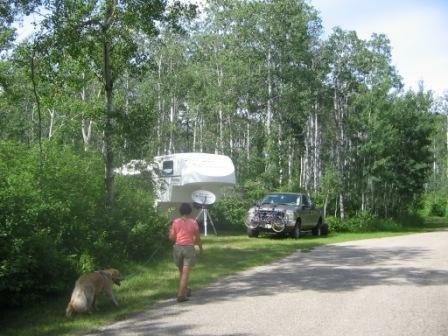 This was our campsite, a great site, except for the bugs. 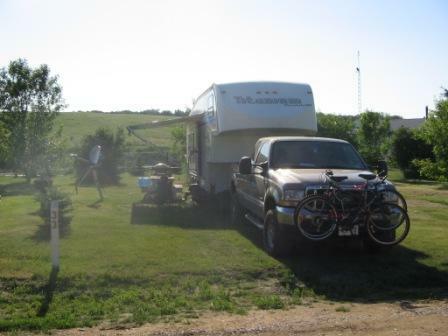 It is quite swampy at the campground, that's what grows the bugs. On the way to Good Spirit, the prarie roads are amazing! It's so flat that you can see the next town from 10 miles away, and the roads are so straight that they disappear in the distance.